Werther's refrigerated air dryers remove moisture and the contaminants it carries from compressed air by chilling the air to a temperature of about 36°F, which causes the moisture in the air to condense and form droplets. These refrigerated air dryers perform the drying and provide compressed air that is useful for a broad range of applications. Our products are engineered for quality compressed air treatment and to avoid costly contamination issues. 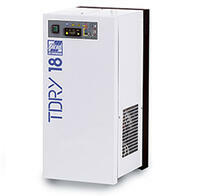 These refrigerated air dryers are reliable, efficient, and compact. A refrigerated air dryer is an energy efficient and contamination preventative product, and Werther's are state-of-the-art.